We did the exercise again, only this time we began our sentences with “Yes, and…” This time around, the story was far more interesting, not to mention funny. As it turns out, the alien had a hilarious name I don’t recall now, as well as a pernicious case of athlete’s foot that got him into all sorts of trouble (you had to be there). We learned then and there that Yes, and is important. Yes, and is the basis of improvisational comedy. It establishes mutual trust so you can have the freedom to fully participate without the fear that someone will attack, negate, or erase your contribution. And this is what makes improv so entertaining to watch–no matter how ridiculous, how strange the scene gets, it keeps unfolding. The characters keep accepting one another’s quirks and taking them one step further. I don’t think we’d laugh as hard if we knew the same lines had been scripted–they are funny precisely because every word, every movement, is both completely unforeseen and completely welcomed by the Other. It’s human nature to take pleasure in this, because, at our core, we want to be loved and accepted–not despite our quirks and surprises but because of them. And so, for the remaining weeks, we focused on training the no but mentality out of our brains, a process so mentally taxing I more than once left class with a headache–there had to have been some neurons getting switched around up there. The tricky thing is, we hardly ever say “No, but…” in words. We communicate it in countless other ways: negative facial expressions, interrupting, not really listening to others, changing the subject, apologizing needlessly, or pretending to kill off every person in every single improv sketch you ever participate in, à la Michael Scott. By far, the person we “No but” most is ourselves (yes, no but is a verb in improv land, as is yes and). My teacher often referred to this as “apologizing with your shoulders,” because of the human instinct to shrug apologetically after doing something we feel was vulnerable, or just plain stupid. To counter this natural tendency, she applied an iron rod of sorts, albeit in a fun way. After we were comfortable with one another, it got to the point that if we so much as faintly winced in embarrassment, she’d stop the scene and make us start all over again, usually tossing in a random twist just because. After a few rounds of this, you quickly learn to just be yourself and get over it–it’s the only way you’ll ever get off the stage. The Annunciation: A “Yes and” Moment? It was perhaps the biggest yes and moment in all of history. And I say that not to trivialize but to affirm the Annunciation–not merely because it brought about the Incarnation, but also because it gives us a picture of the free will and participatory energy that lies at the heart of the human condition. It takes a lot to live in this yes and frame of mind. A lot of openness, a lot of creativity and imagination, but most of all a lot of faith. It means being willing to set aside your ideas, plans, and insecurities and work with what has been given to you in the moment, whatever may come of it. 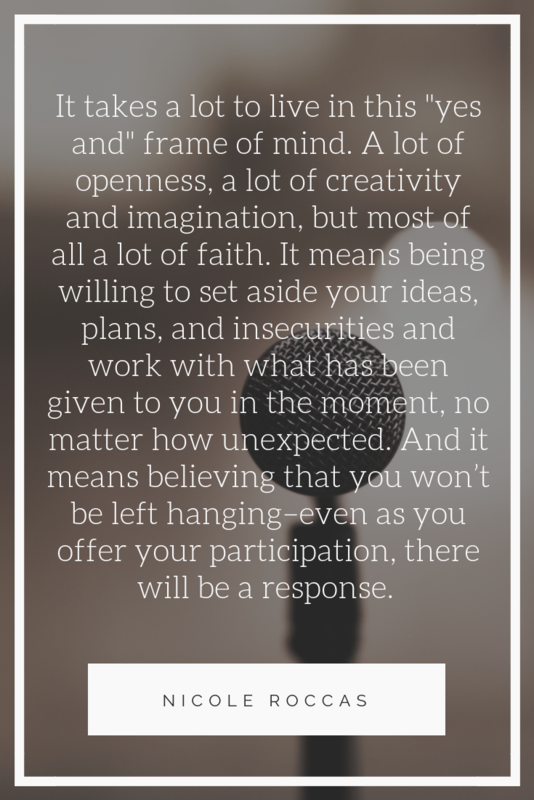 And it means believing that you won’t be left hanging–even as you offer your participation, there will be a response. In stepping into this way of being in the world, Mary is–to borrow the words of Fr. Thomas Hopko–the great example, not the great exception. Just as it was for her, may it be with us according to God’s word. Or, in improv terms, may we “yes and” the divine opportunities we ourselves are given: whatever unforeseen characters and scenes await. Hi Dcn. Jerome! I completely agree about the mystery and importance of humour. 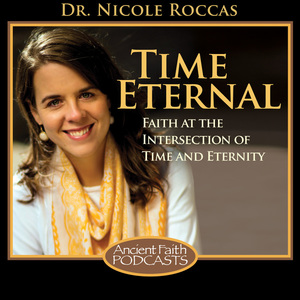 It’s often a form of truth-telling that is undervalued in theological circles (we take ourselves far too seriously! Maybe out of pride?!). I thought the same about improv–that I’d never be able to do it. But taking classes ended up being much more fun that I realized, and they work you up very gradually. You don’t start off doing sketches or character work, but very simple things like clapping exercises and name games. I wish more people would realize how accessible it is! I’ve been reading a lot lately about OCD after a loved one was diagnosed with it, and was surprised by a) how closely related to anxiety it is (and how it is much more a disorder of the mind than outward compulsions); and b) how much exposure factors into therapy and healing. Rather than avoiding stressful situations, the current mode of thinking is that being exposed to triggers in therapeutic and structured ways is actually better for long-term recovery. Outside of the strict context of OCD, I think exposing ourselves to stress and anxiety (or allowing ourselves to be in anxious situations without automatically rereating), and then giving ourselves time to reflect and pray and integrate those experiences in meaningful ways, can be helpful. It sounds like you found a way to do that. Blessings! Just wanted to say how much I appreciated your post! 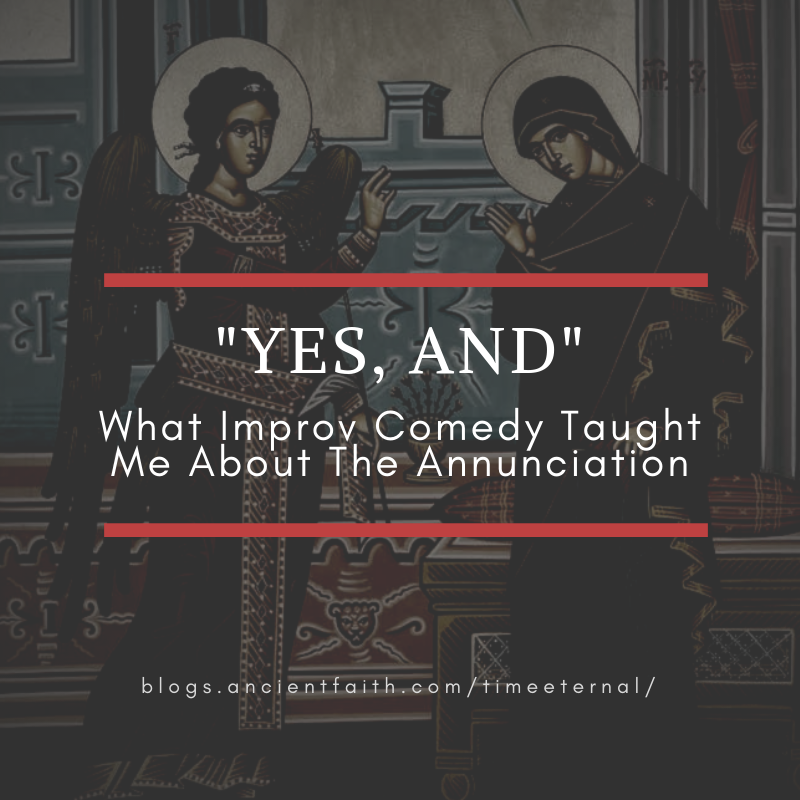 I am an improv fan and I love the lessons you drew from your experience and the annunciation. It truly gave me much to ponder. Thanks Samantha! I’m glad you could relate!